Hi guys,what’s up! My blogpost title makes me think about Beyonce’s song all day long. Let's talk about something real here – age. I’ve realized that I’ve aged up. I’ll be in my 30s in just a few years and I believe a number of my followers & blog readers are almost reaching the same age. Things around me made me realize that I have aged up! Things and places change, especially our skin. Some signs of aging are dark spots, patchy skin, lack of firmness, open pores, dullness, and fine lines and wrinkles especially around the neck area. I found my solution – the Olay Regenerist Miracle Duo which helps to renew my skin to keep it plum, fresh, and hydrated without the fillers! It is a simple skincare routine perfect for a busy mom like me! The Olay Regenerist Miracle Duo is composed of two products. The Olay Regenerist Micro-Sculpting Cream is perfect for your everyday daytime routine. 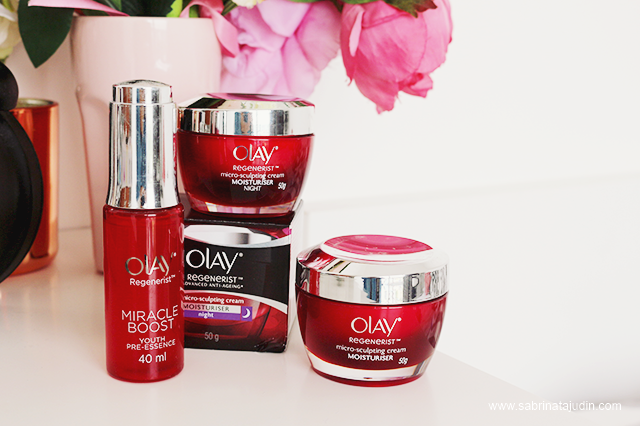 The Olay Regenerist Miracle Boost Youth Pre-Essence is perfect at night. Olay Regenerist Micro-Sculpting Cream is the product of over 50 years of research, and is Olay’s award winning and best selling anti-aging cream. It comes in a sleek red jar and has a creamy consistency. It contains concentrated Amino-Peptide Complex and Hydra-Firming Complex that helps to lift, firm, and micro sculpt your skin. I love it because it absorbs quickly into my skin and feels light and fresh. At night after cleansing and removing my make up, I use Olay Regenerist Miracle Boost Youth Pre-Essence. It helps to boost the penetration of the anti-aging benefits from your moisturizer and increases skin cell metabolism to renew your skin. I experience a nice firming effect after using both of the cream in my skincare routine. It does not leave any greasy feeling and it leaves my skin soft and matte. The unique dropper lets me dispense the right amount of essence I need on every application. When you have the right skincare, make sure to apply it correctly. Pamper your skin with the right products and a little massage. When your muscles on your face tense up, they are more likely to fasten signs of aging. Here’s a quick massage technique that I use for my skincare routine! Beauty isn’t just skin deep. It starts from within. I always believe that by eating right, it helps your skin to be healthy. I love eating fruits and vegetables. I could just eat them all day and I always make sure there is always a portion of vegetables in my meal. They are easy to cook too. I try at all times to use olive oil, which is the healthiest way to fry your vegetables. These help reduce the signs of aging by giving your skin the right vitamins and nutrients. Other nutrient rich foods with anti-oxidants are tomatoes, eggplants, kiwis, avocados, papayas, and apples.